I appear to have fallen victim to the “just stop blogging after a major event” virus following Tales of the Cocktail, so I’m glad Mixology Monday has rolled around to inspire me out of my post-NOLA doldrums. And this month Amelia at Felicia’s Speakeasy has finally lain down the challenge we have so long avoided. That’s right, my cocktail snob friends, it’s time of face vodka! The theme of August 10th’s Mixology Monday is “Vodka is Your Friend.” The recent high profile bashings of vodka interspersed with a few weak “yeah, buts…” left me wondering, is vodka the axis of evil, our most dangerous enemy? While it may not be the life of the party, experts agree: Vodka’s obituary does not have to be written just yet. 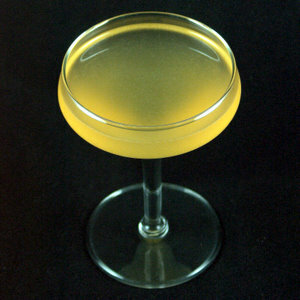 Now, here at Two at the Most, I have reviewed vodka, and even admitted to liking it in my Guilty Pleasure, a lemon drop. But I wanted to try a new-to-me-but-classic cocktail this month. I paged through several of my cocktail books until I hit upon one in David Wondrich’s Killer Cocktails1 — the Mike Romanoff. Shake over ice and double strain into a cocktail glass. Mike Romanoff was born Hershel Geguzin, but passed himself off as a nephew of Tsar Nicholas II. Purportedly the Hollywood royalty he hobnobbed with knew his own blood was not really blue. He did have a namesake restaurant, and this is his namesake cocktail. As usual with Wondrich’s citrus drink recipes, I found the 3/4 ounce of lime juice he calls for far too tart, so I lightened it up to 1/2 ounce, and upped the Cointreau to 1.5 teaspoons for a little more depth and character. I do agree that adding bitters to this drink makes a difference, and it would be a great drink to experiment with different bitters. Next time I may try something like blueberry bitters. While not a terribly complex drink, it is an easy sipper, and a nice way to use vodka as a simple background for playing with other flavors. Thanks to Amelia for hosting this month. Be sure to keep an eye on Felicia’s Speakeasy for the roundup post! Did I mention I totally got to meet David Wondrich at Tales of the Cocktail? This cocktail sounds wonderful! Is there a brand of apricot liqueur you recommend? I’ll have the MxMo roundup posted tonight or tomorrow so check back on my blog. Thanks for participating!